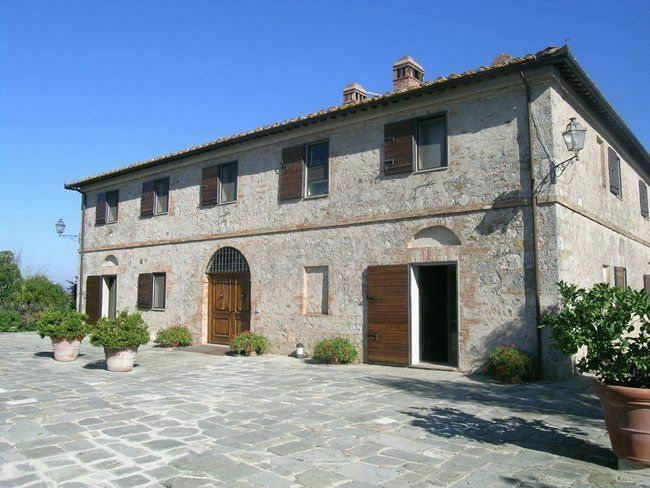 Spacious and beautiful farmhouse with outbuilding and private swimming-pool situated in peaceful location on a large estate enjoying extensive views over the “Crete Senesi” area and Siena in the distance. This villas has been tastefully restored and turned into a splendid country house offering comfortable interiors furnished with ancient pieces. The villa provides a charming courtyard which is ideal for “al-fresco” dining, a spacious and well-kept garden decorated with flowers and plants as well as a beautiful swimming-pool set in panoramic location. The outbuilding is available for rent to accommodate additional 4 people (only together with the main villa), Near the villa, there is a small independent house occupied by the key-holder while the domestic staff live in an independent one-bedroom apartment accessible from the main entrance. The access to the property is via an unpaved but well-maintained road of approx. 900 m. Distances: Ville di Corsano with food shops, a bar, a restaurant and a post office 2,2 km away, Siena 19 km, San Gimignano 62 km away, Marina di Grosseto (beaches) 75 km, Florence (airport) 87 km away, Pisa (airport) 126 km, Rome 230 km away. At guests disposal: large well-kept furnished garden (10.000 square meters), private swimming-pool (15 x 17,5 m – maximum depth 3 m – open from 01/05 to 30/09), loggia (30 square meters) with barbecue, small fridge, sink and hi-fi, bathroom with shower in the basement (under the pool). A tennis court is 200 meters from the villa away and the outbuilding offers a nice and well-stocked gym with shower and sauna. All of the bedrooms are provided with air-conditioning. Parking within the grounds. Extra services to be paid on the spot: Baby bed (free of charge). On request it is possible to arrange lunch or dinner service to taste nice recipes typical of the local tradition (€ 40,- / per person / per dinner or lunch). Maid service available by arrangement (€ 20,- / per hour). Upon request it is possible to rent the outbuilding ground floor (price upon request) comprising a living-room (satellite TV) with dining area and fireplace, kitchen (oven, freezer, dishwasher) with access on to the outside, 2 double bedrooms with access on to the outside and enuite bathroom with shower. 600 m2 Ground floor: entrance, large living-room with fireplace, billiards and access to an internal courtyard, small sitting-room with access on to the outside, dining-room with access on to the courtyard, large kitchen (oven, freezer, dishwasher) with fireplace, ancient bread oven and access on to the outside, toilet, laundry (2 washing-machines and dryer). Small wine cellar in the basement. 1st floor: large and bright living-room (satellite TV, computer with fax and internet connection), large suite with double bed, living corner, fireplace, satellite TV, access to a small room with piano, wardrobe and ensuite bathroom with Jacuzzi bathtub, double bedroom with fireplace and enuite bathroom with bathtub, double bedroom with enuite bathroom with Jacuzzi shower, 4 double bedrooms, 2 bathrooms with bathtub (without window). In the outbuilding 100 m from the main villa away Basement: bright room with gym equipment, shower and sauna.